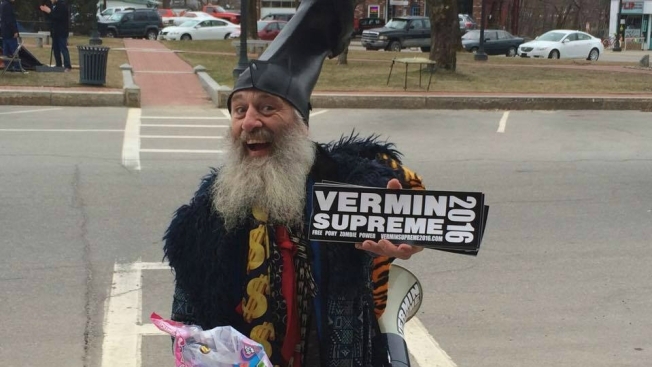 Vermin Supreme outside a Rand Paul campaign event in Milford, New Hampshire, in 2015. A performance artist and perennial candidate in New Hampshire's presidential primary is suing the state capital, saying its refusal his request to bring two ponies to his planned protest of Hillary Clinton's book signing violates the First Amendment. Vermin Supreme ran as a Democrat in 2016. The Massachusetts resident wears a rubber boot on his head and once threw glitter at another lesser-known candidate during a debate. He asked a federal judge Friday to compel the city to issue him a permit allowing him to bring the ponies to Clinton's event, scheduled for Tuesday. Messages to city officials weren't immediately returned. Supreme says Clinton's book, "What Happened," attacks his political platform to provide everyone a pony. The book references a Facebook post satirizing the race between Bernie Sanders and Clinton.